By Shaunna Evans 29 Comments · This content may contain affiliate links. I love putting together a new sensory bin for the kids. Last week the kids started exploring our new Christmas sensory bin. Watching them as they dig into it the first time is always so much fun. I am always intrigued by the different ways the kids utilize the elements of the bin. Big Buddy usually lines up all of the items when he first plays with a new sensory bin. Lovey usually looks for things that make sounds or have a scent. 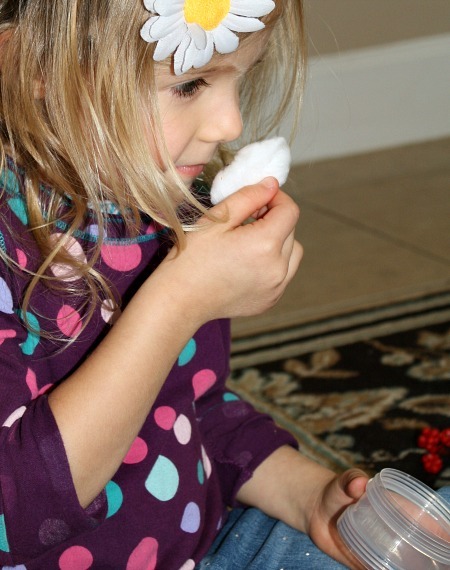 Why play with sensory bins? If you haven’t used sensory bins yet or if you are not sure why you would, The Outlaw Mom gives a good, brief description of sensory bins and their benefits. Starting this bin a few weeks before Christmas will give us many opportunities to use it in different ways. Exploring: This first week I will simply leave the bin out for the kids to explore on their own. This self-directed learning and sensory exploration is the primary focus of sensory bins. The kids will feel the different textures, smell the scents, and observe the objects. During this time I will also watch to see what they are naturally doing with the objects so I can decide which activities we might do next. In the next week or so once I see that the kids are done freely exploring the bin, I will start using some of these options for extending its use. These are more adult-directed than free exploration, but they will allow us to focus on specific skills. Name objects in the bin for Tinker (20 months) and ask her to locate them. As she is able, ask her to pick up an object and name it. 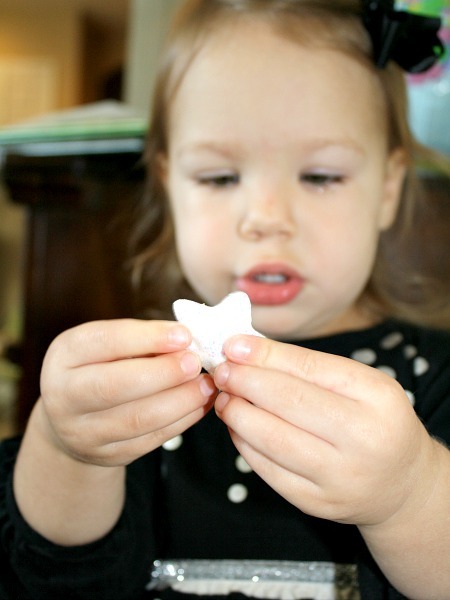 Play “I Spy” with Lovey (3 years) by describing an object using its physical description (color, shape, size, texture). 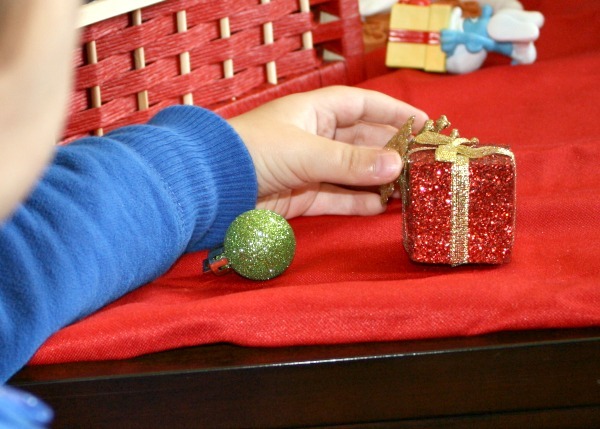 Are you making a Christmas sensory bin? What will be in it? 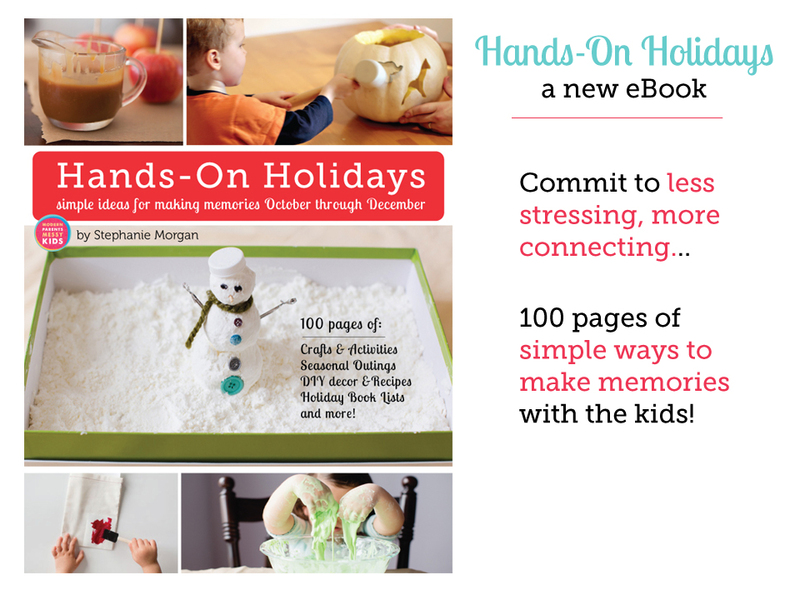 Hands-On Holidays eBook-Get even more inspiration for your advent calendar. I am glad you enjoyed the bin! Thanks so much for featuring it. Thanks for linking up to Tuesday Tots! 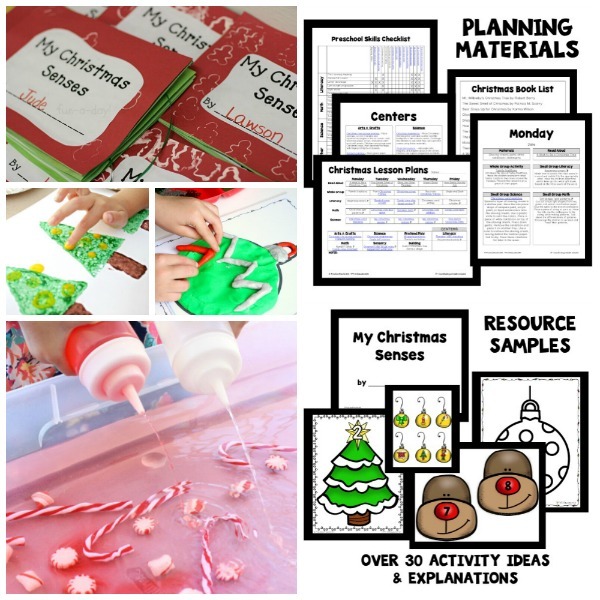 I am featuring your post this week on In Lieu of Preschool: http://www.inlieuofpreschool.com/2012/12/15-christmas-sensory-activities-for-kids.html Please feel free to stop by and grab a featured button! Off to pin. Thanks again! Thanks so much for featuring this post. That’s quite a collection of sensory activities you’ve got! I also shared via my social networking sites. Thank you! The kids have really enjoyed it. What a visually stunning sensory bin you created for your kids! Thank you for linking up to my Enchanted Thursdays Blog Hop this week! I am glad you like it! Thanks for hosting the blog hop. We really enjoy them, too. Thanks for the invite. I will be by soon to link up. I love sensory bins! I do the every 2 weeks in our classroom. Kids really love it! Always looking for new ideas! Thanks for sharing! My kids really love the sensory bins, too. I am so glad you found the ideas helpful. Hope your kids enjoy them! what a fun sensory bin filled with so many different items. will be pinning this. thanks also for linking up to tip-toe thru tuesday! Great description of the ways you can use a sensory bin for learning! This info is so important. Thank you! I am glad you found the ideas useful. I teach English to small groups young French children in my own home. and they’ll strengthen skills like numbers and colors. Merci for this lovely idea! What a wonderful use of the activity! I hope the children enjoy it. 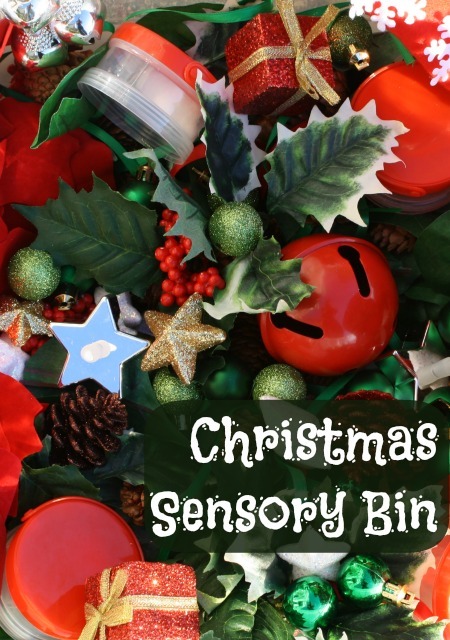 Wow, what a great Christmas sensory bin. Love the ideas you shared. I have not dug out all of our sensory items packed away from last year. Thanks for the reminder to get that bin out and start playing with it! 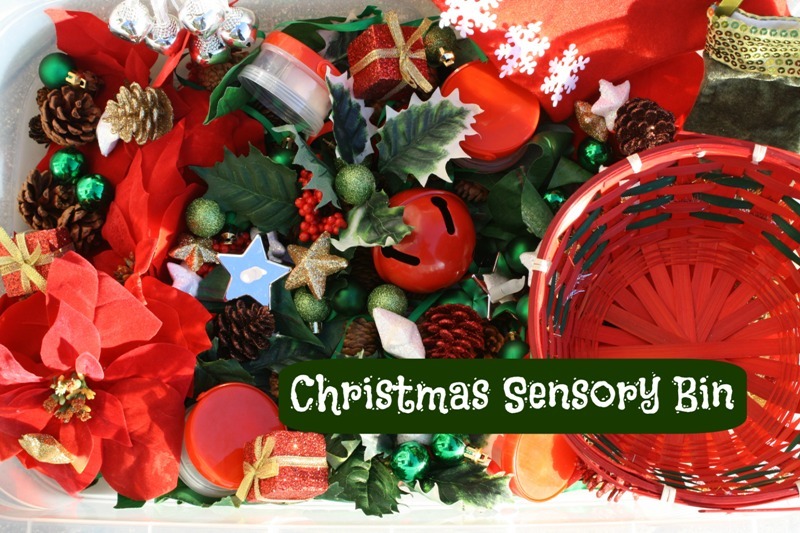 I love your Christmas Sensory bin. It reminded me that I need to put Bug’s together this week! Thanks, Amber! I just took a look at your blog. Congrats on your first month blogging! Last month was my first month, too. Hope Bug enjoys the new sensory bin. What a lovely bin and a complete explanation of what to do with on. great post. Thanks so much! The kids are really enjoying the bin. I love your sensory bin! I may have to add some of your elements to mine! And the extensions are great! Thanks for sharing! I am so glad you liked it and found the extensions helpful.